Pixel has been having docked tail troubles since Sunday, so she's had a rough few days of nerve pain and distress. Last night while she was behind me on the bed while I worked on some dog photos from the shelter, she somehow created this perfect 'nest' to keep her warm, keep the tail covered, yet still have the ability to watch her Mommy like a hawk. I turned around to check on her and this is what I saw. It's because of these types of things she does that I keep the camera always at the ready! To learn more about Pixel's docked tail issues and learn about the truth and dangers of tail docking for dogs, please visit our No Tail Left Behind campaign page. We would love your support in our efforts to educate pet owners and rescues about the long term effects that docking can have on dogs. Thank you! I am reporting to you from the back seat of my Auntie's car right now, because sometimes you have to report where the action is...or was. Saturday, all the girls (human & canine) in my family went to a festival in a nearby town called Plumb Alley Day. 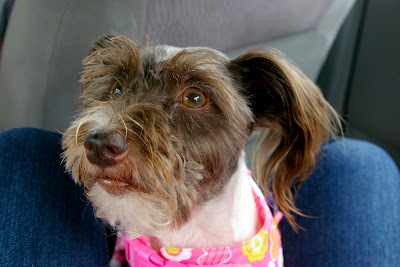 I went with Mommy, Auntie Helen, Grammy, Peanut Pumpkin Pie and Dixie Mae Doxie to a wonderful festival in another town. 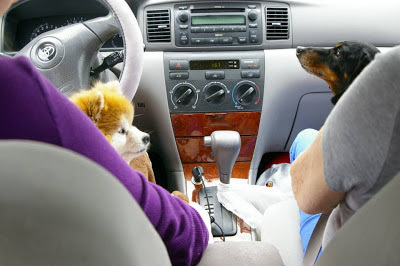 Mommy & I sat in the back seat, Auntie & Peanut drove & Grammy & Dixie were their side seat drivers. The festival is called Plumb Alley Day, but we found out when we got there that they weren't celebrating plums at all. Nor where they celebrating Plumbers or even alleys. We were very curious as to what this "Plumb Alley" was all about, so we set out to find the truth...and some fun! When we first arrived on the scene, I of course had to scout things out first. I might not be in charge of the show, but I like being part of the security team...pink dress or not! 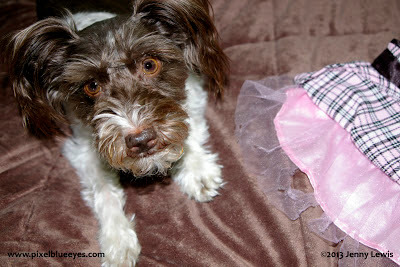 No one would ever guess a little dog in a pink dress could be law enforcement, but by golly I am. I am always happy to protect and serve while still remaining stylish & cute! After I felt it was safe, I let Dixie take charge of navigation. She's been getting much more brave and confident over the last month or so, and I am so happy that she is feeling that good about things! 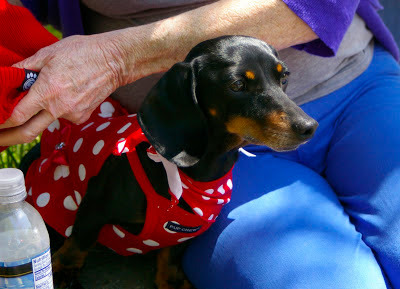 o, Dixie Mae Doxie led the way through the crowds as we headed to the food & the music. She was fearless! Look at her pretty ears swishing while she walks with style. The first thing we saw was a huge crowd of people and pets, and some great dancing being done by the Crooked Road Cloggers. These girls were fantastic and had a fun time dancing to all kinds of music! Their sparkly sequin shoes looked so pretty in the sun. Now that is a creative 'tap shoe'. They just started a new Facebook page, so if you like dancing and want to support a local small town group, please go visit their page. They were so kind to us pups too! We talked to them after they were done and each one of them were very nice. In case you didn't know, the "Crooked Road" is a 300 mile long Virginia Musical Heritage road, with many wonderful stops that share the rich history of country and bluegrass music along the Appalachian mountain chain. We met lots of doggies while walking along the "Plumb Alley"...we found out that it is indeed an actual alley. It's a long narrow road behind Main Street in downtown Abingdon Virginia. Vendors, non profit groups, and businesses of all kinds come and sell new and used wares, food, snacks, and everything in between. 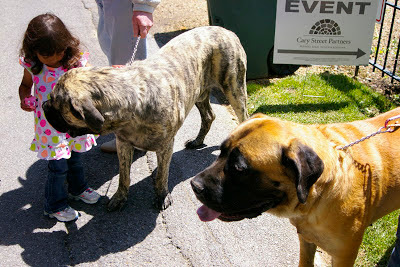 This is Morgan (amber colored dog) and her brother Sledge (cream colored Brindle) who are both English Mastiffs. They were SO nice and gentle to everyone. The little kids were so gentle with them too, it was great to watch. I even sniffed noses with Morgan from my carrier. She was very nice and had a great smile. Even though I was in my carrier, that didn't mean I was off duty. I met a lot of nice people who were very sweet, but I also kept my watchful Pixel eyes sharp for any signs of trouble. In this day and age, you can never be too careful. 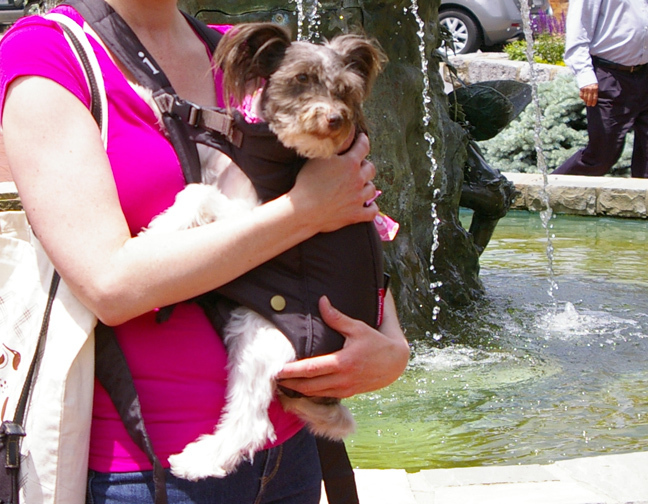 Part of my years of training includes the fact that I can turn my head around really far while in that carrier, with a 270 degree area of vision. Just don't make me sit facing out...I feel like I'm floating but not in a good way. So I always sit facing Mommy so I can give her surprise kisses when she least expects it. Dixie wanted to sniff every single thing that was not (or even was) nailed down. She was just amazing to watch. "Hey Mommy, I'm pretty sure they're cooking fresh dog bones down this part of the alley." She looked so pretty in her bright red & white polka dot dress. 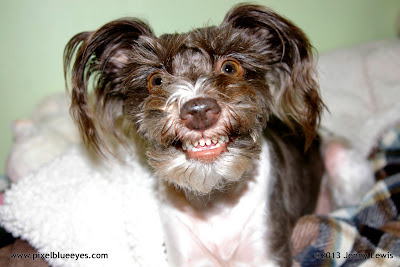 She makes such a beautiful puppy mill survivor advocate doesn't she? No wonder everyone wanted to pet her. We all were just so happy that Dixie enjoyed herself. She let pretty much anyone pet her who wanted to, whether it was little kids or big adults. She has come so far since adopting us as a scared, uncertain little rescue. She loves her new life and is feeling more and more comfortable everyday! Grammy and Dixie have such a great bond that they both share too. It is beautiful to see her feel so safe and loved in Grammy's arms. They are crazy about each other! Everyone really loved that all three of us girls were 'dressed for the occasion'. Peanut was quite a people watcher. She's been sick for a long time, so it was great to be able to bring her out to have some fun. Her hat was just too adorable for words, but it also served to protect her delicate eyes from the sun. She has eye issues, so her Mommy takes extra precautions. This is Smokey, another cute dog we met while at Plumb Alley Day. He was helping his Mommy in their "Sweet Virginia Girls" booth sell pretty hair accessories and other items to make a girl feel pretty. They are advocates for Autism and are helping raise funds for those who live with Autism and their families. We of course bought several items from them. Several times throughout the Dixie Mae Doxie went off to seek adventure on her own, not realizing that she was always tethered to a lead. She sniffed everything and anything. Dixie didn't meet a single blade of grass that she didn't know. She always came back though, but only after she felt satisfied that all had been investigated and properly assessed to her liking. This little lady is just as much an adventurer as I am! What a brave little sister I have! She won the crown for being "Miss Mischievous" paws down. We brought our own food, so we had a small picnic in the car after we had sufficiently tired ourselves out. It was too hot to eat outside, so the air conditioned car made a perfect spot to eat. Everyone was passing bags of food to and fro, so anything that passed my way to Mommy was inspected for safety by yours truly. 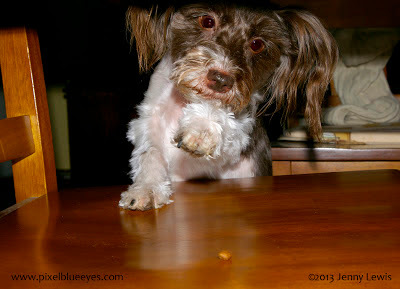 I am becoming a wheat/gluten sniffing dog for Mommy...at least in my mind I am! Peanut was very interested in what Mommy was eating in the back seat with me, even though her own Mommy was eating the very same thing, BOL. She looks awfully adorable with her sweet smiling face! Our picnic included homemade gluten free banana nut muffins, hard boiled eggs, cheese, some other nums I can't remember, drinks, and one special treat we bought while at the festival...fresh, made in front of you cinnamon-sugar coated pecans, guaranteed gluten free. 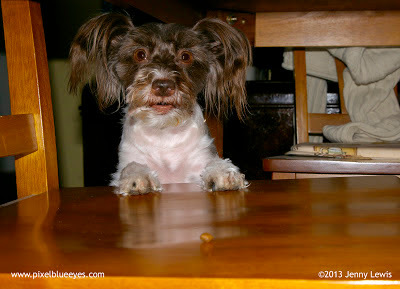 Us pups can't eat nuts, but we did get to have tiny bits of the banana muffin without the nuts. It was a great picnic!! Finally, after getting fully exhausted from the festivities, and then getting a nice full belly, we started our drive back home. Peanut and Dixie Mae were completely worn out and slept most of the way home. This is a recap of my adventure for the "Monday Mischief" blog hop hosted by Alfie, My Brown Newfies and Snoopy's Dog Blog. Go by and visit their blogs, and click on some of the links below to see what other mischief occurred with my fellow pet bloggers this weekend. 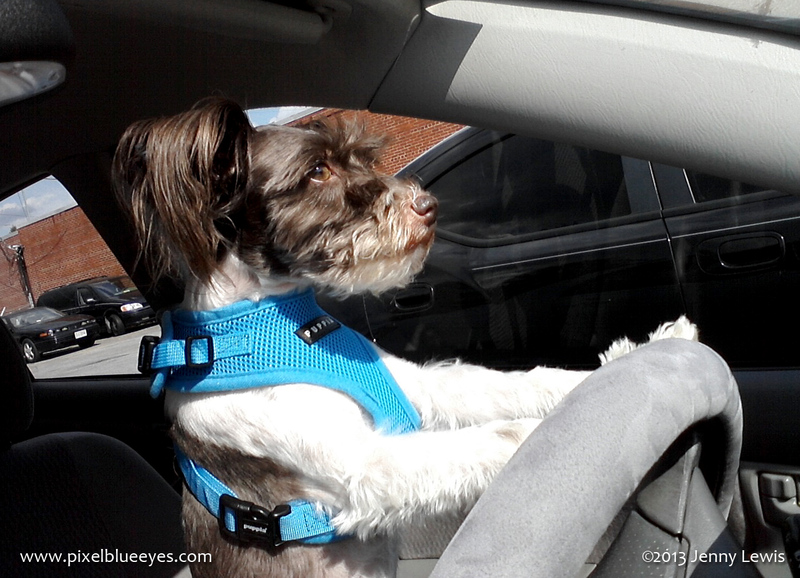 The Joy of a Road Trip - Pixel Blue Eyes is Driving to Blog Paws 2013!! 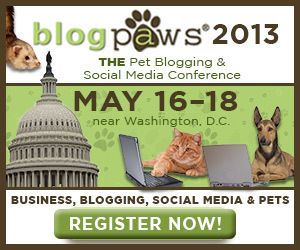 Mommy and I are all packed up and ready to start our big adventure in D.C. at the BlogPaws 2013 Conference!! Mommy is very tired and not often an early morning person, so I promised her I would drive for the first part of the trip so she can rest. I take my driving very seriously you know. 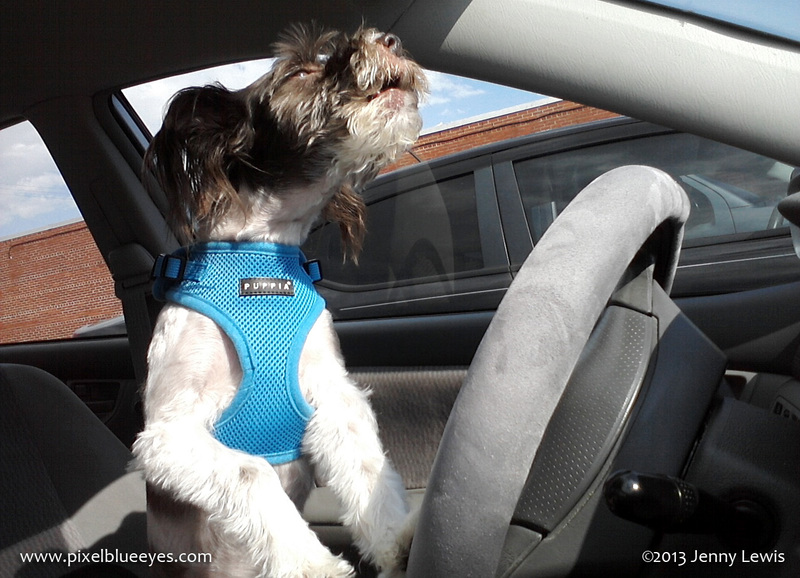 Must always keep your paws on the wheel and your eyes alert for oncoming traffic or crazy cat drivers. I can't help but sing while I am driving too, especially when one of my favorite songs comes on the radio, like "Who Let the Dogs Out?" which of course is the theme song to my good friend Tillman Skates show by the same name. Woo hooo! Mommy and I are going to have so much fun on this trip!! Can't wait to share all my experiences with you.It'll be a week to remember!! Happy Mostly Wordless Wednesday friends! 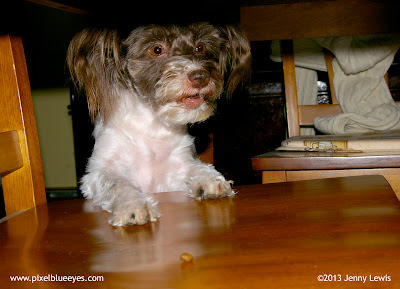 Please visit my fellow pet bloggers links below and see what they are up to today. 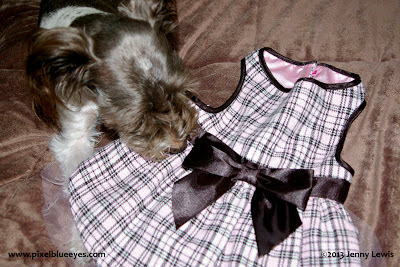 This is my special dress that I will be wearing for the awards ceremony at the Blog Paws convention this weekend. I've had it hanging up in Mommy's & my closet safe from getting hurt in any way...or so I thought. 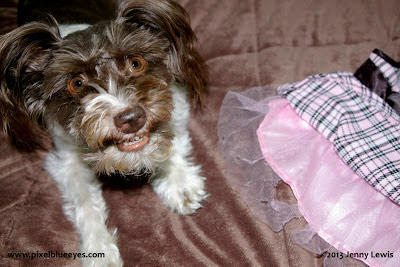 This weekend, when I was packing my doggie travel bag for the trip, I got my dress out and low and behold, it was torn. I'm not naming names or anything (Snowflake), but I know that one of my kitty sisters (Snowflake) likes to climb up into our closet and play in there. Why did she think this was a toy? "Sweet Pixel, I can fix this dress. 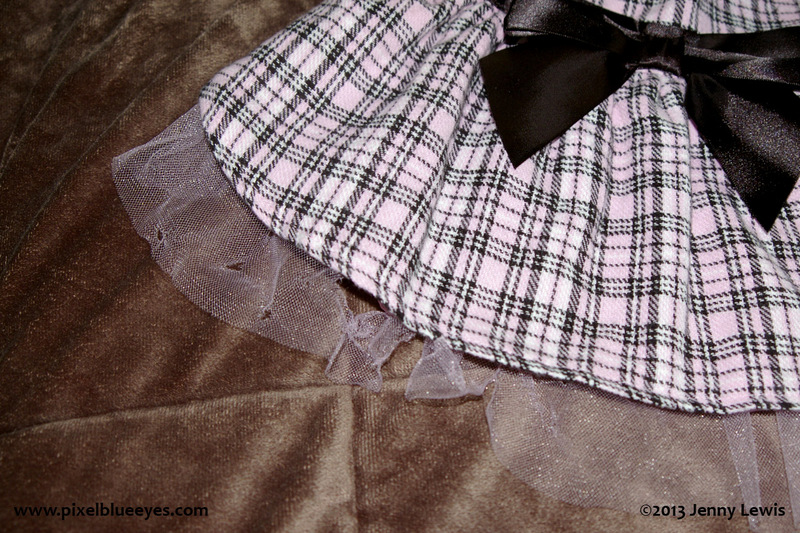 We are very lucky that only the inner lining got ripped up, the outside of the dress is still perfect! Let me see what I can do." "Yayyy! Thank you Mommy, I can't wait to see what you do!" I said with a huge smile on my face. Next thing I know, Mommy takes the dress and in a mere five minutes, comes back and it looks perfect. All she had to do was cut off the inner lining part, it still looks beautiful and no one would ever know, except for everyone who reads this blog, BOL! 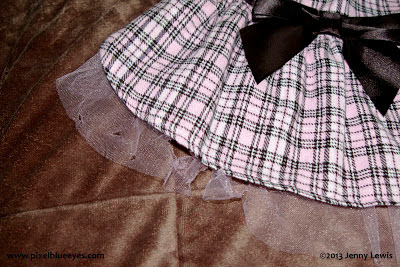 So, kitty mischief or not, I still have a dress for Blog Paws! I still need to go have a talk with the kitty (Snowflake) in question. "Oh Snooooowflake!" This is a Pixel Blue Eyes special report! 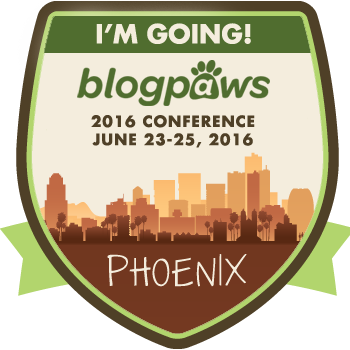 I am so excited to share this good news with all my friends as we continue to prepare for our great adventure of going to Blog Paws 2013 this week!! Last week, the Blog Paws team told all bloggers who are planning on attending the Blog Paws 2013 Pet Blogging and Social Media Conference, that Pet Finders, the world's largest pet adoption and care website, was having a contest to "adopt" 10 bloggers who are actively involved in or have a passion for helping rescue pets. The 10 bloggers would then be given some great opportunities while at the Blog Paws conference.Bloggers just had to answer some questions that Pet Finders posed to learn a little about what we do. The two main questions they asked were 1) Explain how you help adoptable pets and pets in need"; and 2) "What inspired you to help pets in need with your blog?" 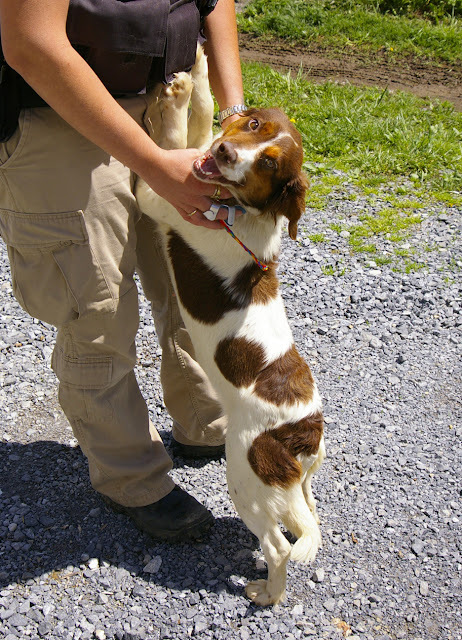 What Mommy Jenny wrote about her work with the Smyth County Animal Shelter is below. 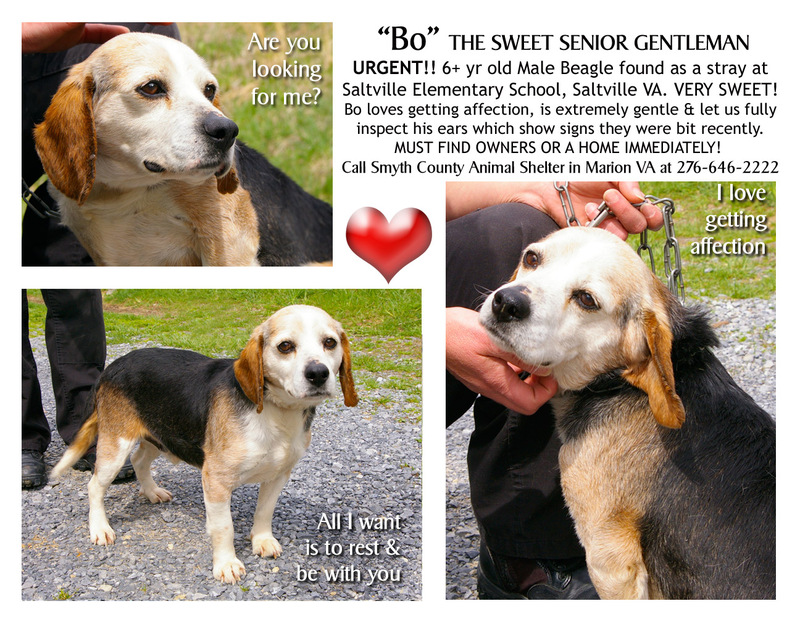 Senior dog Bo was adopted by a wonderful couple! I volunteer each week at my local shelter. Every weekend I go to the Smyth County Animal Shelter in Marion VA and take pet portraits of all adoptable dogs and cats, working closely with Officer Kristy Moore (an amazing animal advocate) and the wonderful shelter staff. I take my time with each pet, as needed, to help bring out a smile and make them feel more secure as I take their photos. I spend many more hours making adoption posters for each pet, adding extra special touches to make the posters and the animals themselves as appealing as possible. 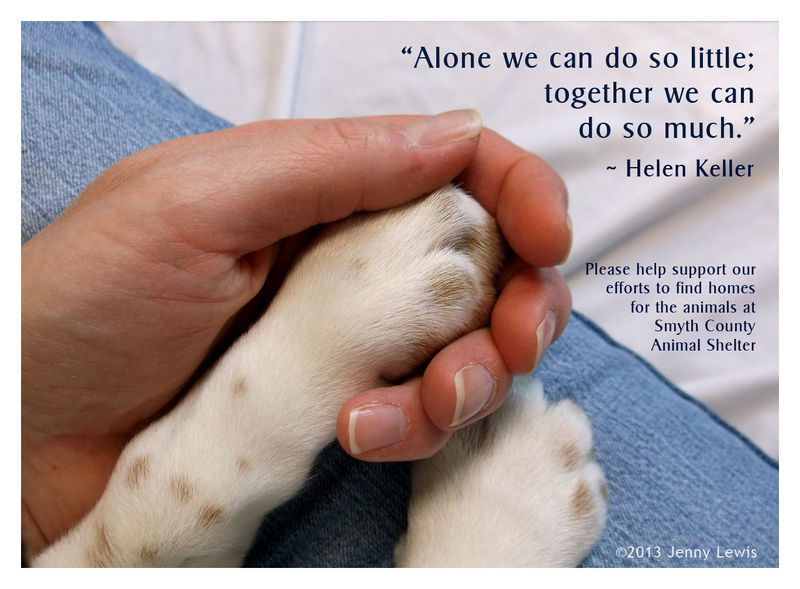 I am co-administrator for the shelter Facebook page, and upload all the posters as they are completed, encouraging our followers to share, cross post and adopt. I regularly contact rescue groups and individuals about certain dogs or cats, such as breed specific rescues, senior rescues and other special cases. I also create funny, charming or emotional posters & cover art for the shelter page, to keep people engaged & interested. It is a constant labor of love that averages around 20-25 hours per week. 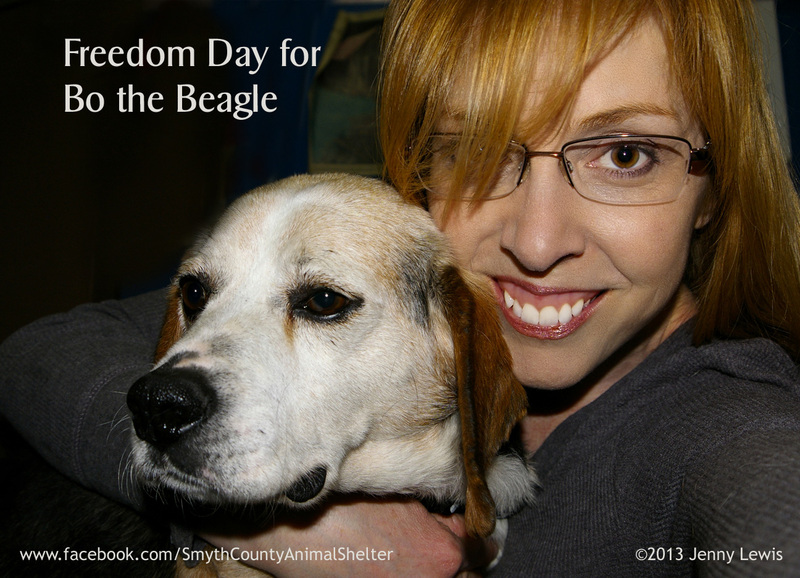 The puppy paw I am holding belongs to a beagle pup that was adopted! I not only post the adoption posters on the Smyth County Animal Shelter Facebook page, I also do periodic blog posts on my "Pixel Blue Eyes: Her Tails of Adventure" blog (www.pixelblueeyes.com) about my efforts, sharing the adoption success stories & photos, telling stories of how my little girl Pixel helps me prepare each week for the photo shoots, and showing the world how easy it is to volunteer and help the animals. It is rewarding beyond anything you could imagine! 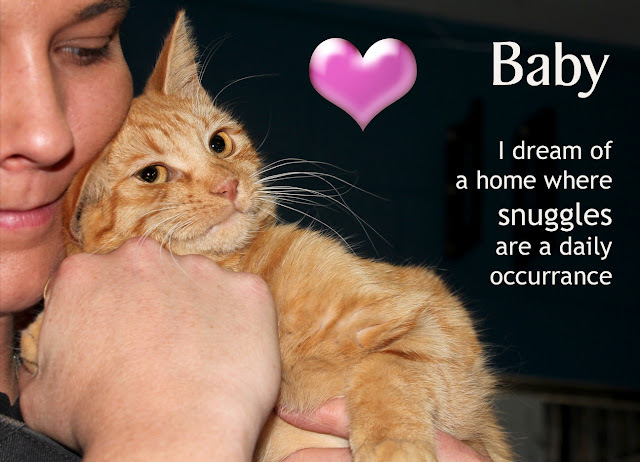 I often share special needs pet posters on my blog's Facebook page & twitter account as well, because social media is a remarkable tool for helping find homes for pets in need! One particular case is extra special. 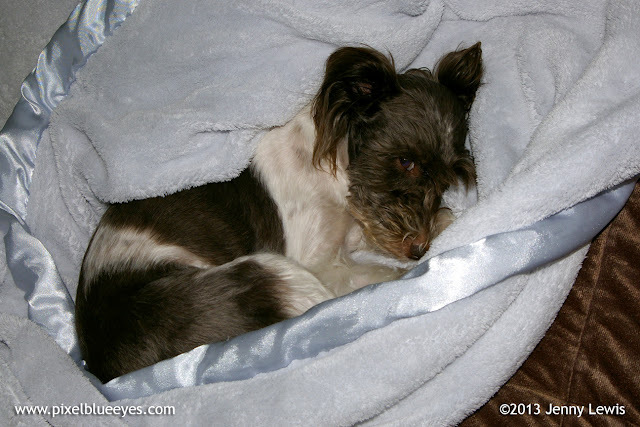 A seriously neglected mini schnauzer, visually impaired, and covered in thick fur & mats, was in desperate need of a home and he didn't have much time. 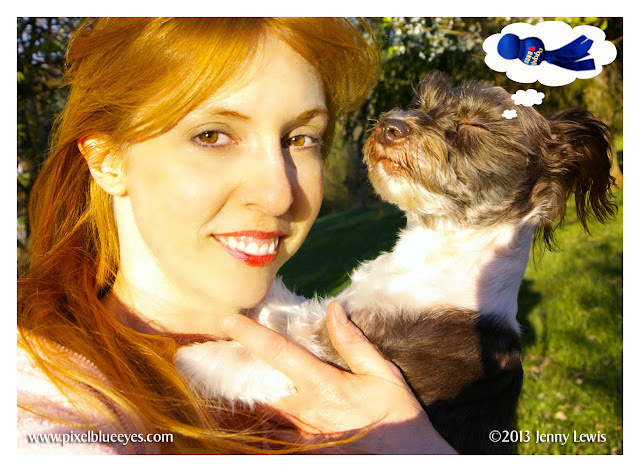 I posted his photos & heart-wrenching story on my "Pixel Blue Eyes" blog Facebook page and within a few hours he'd been shared over 300 times. 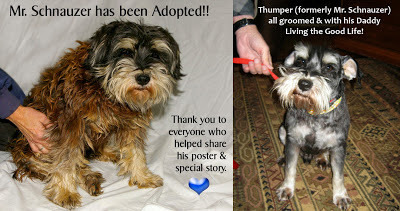 Within 2 days Mr. Schnauzer was adopted by a Pixel Blue Eyes fan, who drove for hours the following Wednesday to adopt his new "boy", who is now named Thumper and living the good life! 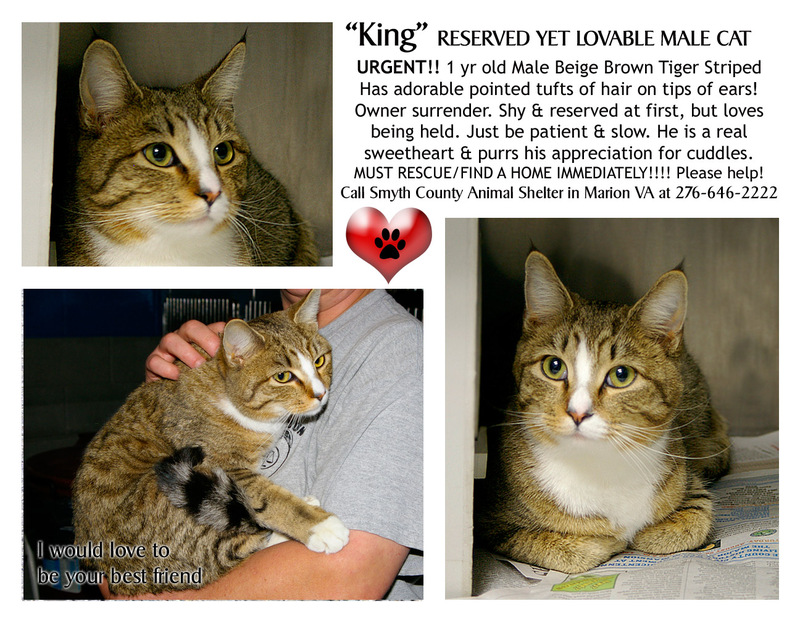 I have become friends with many of the adopters, so getting updates on lives I've helped save is a tremendous gift! 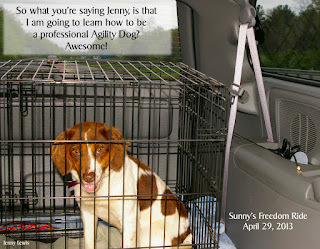 Sunny really is getting trained by her foster mom in agility. Our little shelter has had dogs go on to be therapy dogs, agility dogs, and we've brought people together like never before. I am thrilled over the incredible success that 20-25 hours per week of volunteer work has brought about. A million dollars could not make me feel as rich as I do knowing I am helping make a huge difference in the lives of so many animals! I was inspired to help pets in need personally and with my blog after seeing so many photos of rescued animals in terrible conditions and looking completely hopeless. We've all seen those photos...the dog or cat is sitting or standing slumped over, it's the worst day of their life, they are scared, hungry, abused, dirty, and someone snaps a quick photo or two where you often cannot even see the animal's face. It is terribly sad and distressing to see such suffering. How can any shelter animal get adopted and find a forever loving home if the only photos of them show a forlorn dog with a defeated soul or a cat with a broken spirit? After seeing so many photos of miserable pet in need, I realized that I could offer my photographic skills to my local shelter and see if some great pet portraits would help get some of them adopted. I called the Smyth County Animal Shelter in Marion VA in February 2012. I spoke with Officer Kristy Moore, a wonderful woman who had been working hard for months trying to get a web page and Facebook page running for the shelter. She was trying to do all she could to get the animals there some exposure to increase adoptions, reclamations and rescues of the animals. It seemed my timing was perfect. Shortly after we connected, I had two medical emergencies including emergency surgery at the end of April, but we hit the ground running at the beginning of July, 2012. Our very first week of pet portraits resulted in 6 animals being adopted in a week. Kristy and I were elated, and I did my first blog post about that wonderful first week of success as part of the "Bloggers Unite for Dog Rescue" blog hop on July 23, 2012 (http://www.pixelblueeyes.com/2012/07/the-joy-of-helping-rescue-dogs-pet.html). 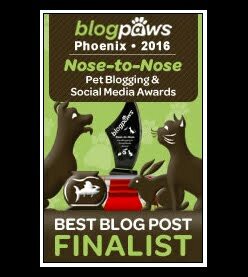 So my friends, we are incredibly thrilled that our blog was picked as one of the 10 Pet Finder blogs to be "Adopted" at Blog Paws this week! 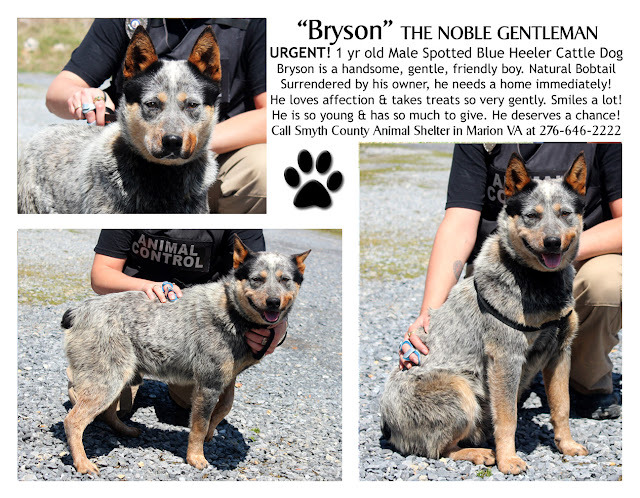 I hope you will take a moment or two to visit the Smyth County Animal Shelter Facebook page. You never know when sharing a photo or even looking at them might mean the difference in the life of a precious homeless pet, or in the life of another person. True love lives and pets are where it's at! I am of a very serious frame of mind in this photo...can you tell me what I am so concerned about? And what I might be talking about? I promise to tell you everything...but I want to hear your ideas. Leave a comment with your guess, then select this link to read on. But don't read ahead until you've given a guess as to what I am so serious about. 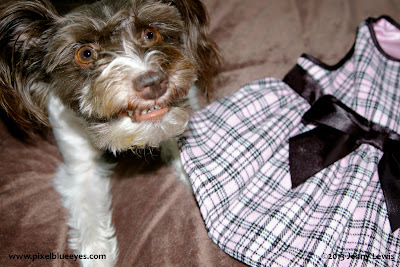 As always, my thanks go out to my friends at Blog Paws who host this Wordless Wednesday blog hop. 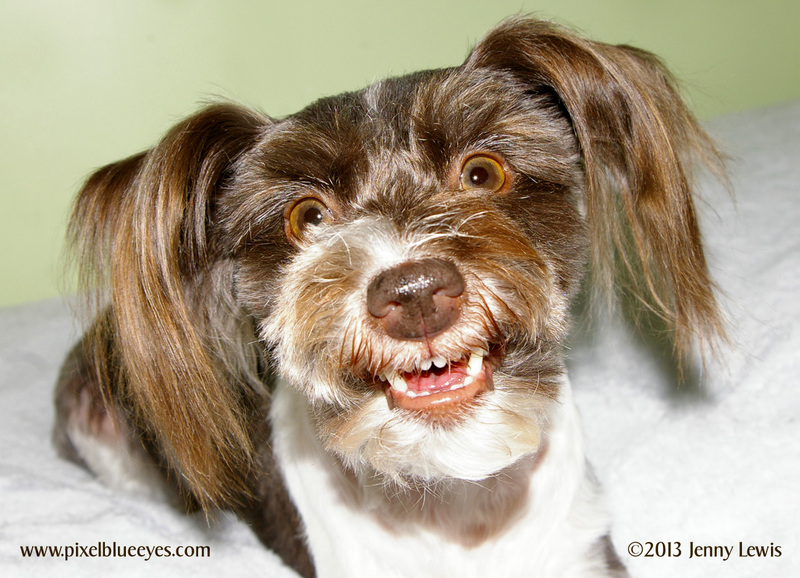 I can't wait to meet you all next week at the 2013 Blog Paws Convention. Mommy & I are getting our final touches together to attend. Click on the links below to see what my other fellow pet bloggers are doing today! I want to talk about a very important subject right now...a subject that is of great importance to me. I hope you will open up your hearts and minds to this all too common, yet highly hidden topic. Long Lost Kibble. Look at this poor long lost kibble that I found just recently. It's alone, isolated, rejected (by the cats) and abandoned. This poor kibble has no one to love it, no one to come looking for it, no one to care what happens to it. That is why I am here. I have made it (one of my many) life's mission to go and seek out long lost kibble such as this one. 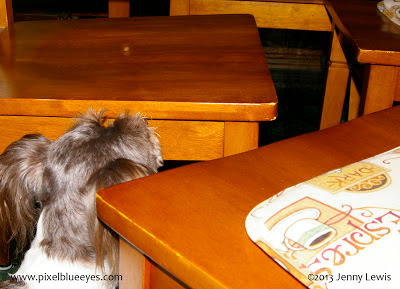 I know you've heard me talk of this delicate subject before, but seeing this one lost on a dining room chair is just too much! How could things have gone so wrong for this kibble that it is left alone? It all started when I was helping Mommy and Auntie in the kitchen. I was walking by the dining room when I sensed it...something was out of place (besides the slumped sweater on the chair). I could feel despair, I could feel loneliness, I could feel a little kibble....alone. I breathed deep so I could triangulate it's location. I followed my nose, and that's when I saw it. The long lost kibble. 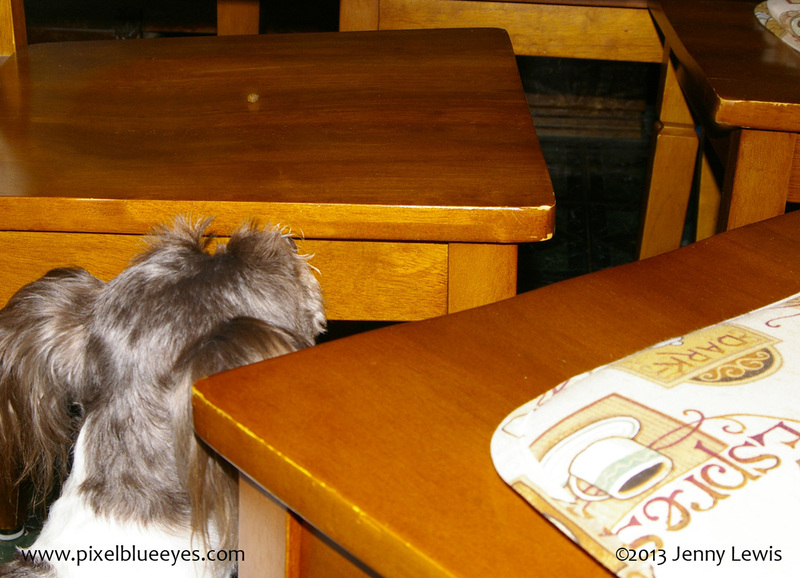 I needed to get a better vantage point, so I snuck around carefully to the other side of the chair, careful not to startle the lost kibble. Once I had a good spot, I immediately sent out the distress call to Mommy and Auntie, doing my normal 'lost kibble warning' of a low Grrr-howl that is our special signal that kibble is in need of rescuing. Auntie came over and went to reach in and get it but I ran back around to her side and lovingly stopped her immediately. I put my paw up (the universal sign for "wait") saying, "Auntie, please wait! I am a professional and I must be the one to get it." She immediately understood and put it back. Since I needed Mommy to document this newest Long Lost Kibble extraction, I went BACK around to the best side of the chair so she could capture the drama. Once I was back in position, I had to stop and think things through...I was close enough to do whatever extraction was necessary to save that lone kibble, but I wanted to do this right. 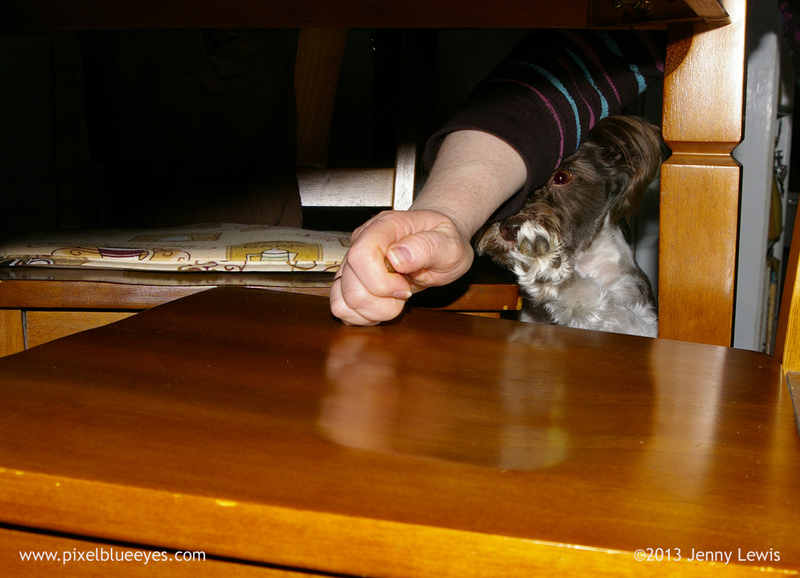 I realized that the 'soft paw' approach was best in this case, based on height of the chair, my height, the location of the kibble in relation to the sides of the chair, and the type of kibble that was under duress. "Come here my little long lost kibble," I cooed to the tender morsel as I slowly and ever so gently raised my paw to reach for it. "There, there little kibble. I'll save you." I could sense that things were going well as I inched closer and closer. Finally, the perfect moment arrived. I made a breakthrough and I was able to actually touch the kibble! They call me "Pixel Soft Paws" in certain Nursing circles for my gentle pawed approach to nursing, so I have worked hard to hone that same technique in the search and rescue efforts of lost kibble. 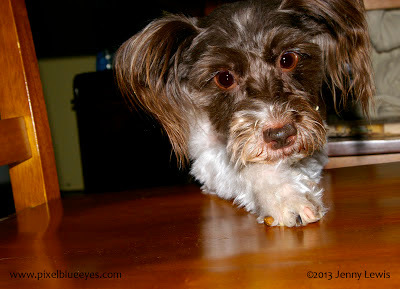 By golly I set out to save this little kibble from being lost forever, and I succeeded! As I moved in for the last portion of the long lost kibble extraction, I felt glad that I could help this little kibble be lost no more. It would now be appreciated and loved forever. That's all any of us hope for isn't it? So next time you see a long lost kibble, all alone, don't just leave it there. 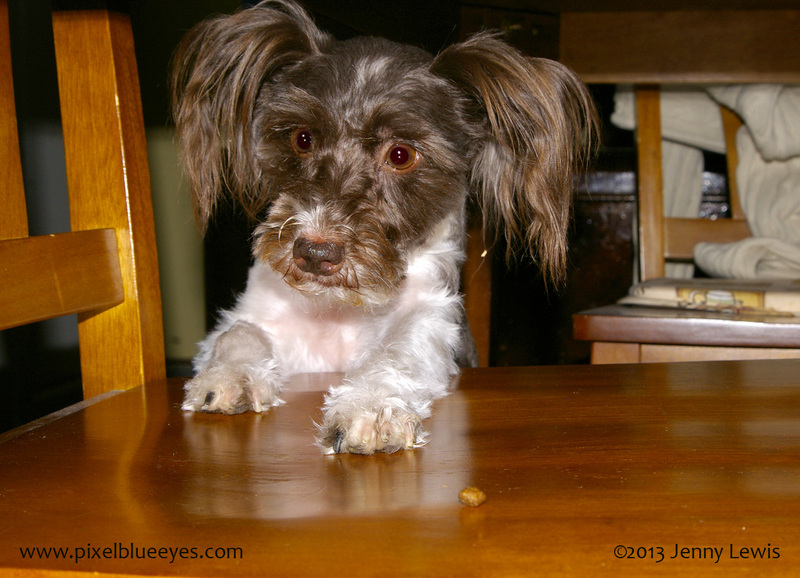 Be kind to the kibble and save it. You'll be so glad you did! 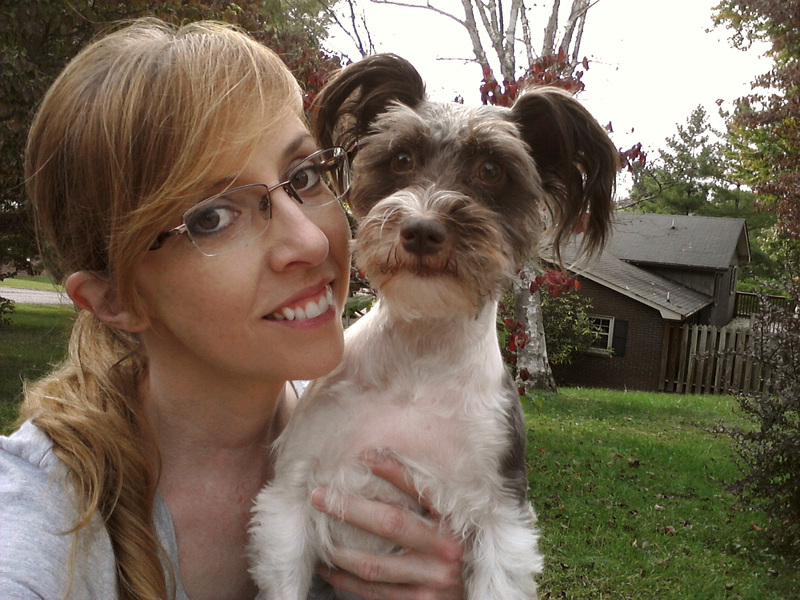 I can't believe that in just two short weeks from today, Mommy & I will be at the BlogPaws 2013 Convention & Social Media Conference in DC. We are SO excited!!!!! There is going to be a lot of different people from the pet industry, so many of my fellow pet blogging friends, special meet & greets, wonderful rescue groups, amazing presentations, awards, and tons of networking opportunities. I have not told Mommy this yet, but I've been thinking a lot about the networking part of it. Every dog has a dream of making it big in one way or another. I have a little dream too, actually, one of many dreams, but for now, I will focus on this little doggie prayer. Dear God, please let representatives from the Kong Wubba toy company be there, and let them be looking for a little dog like me that loves their toys more than treats, and let them ask me to be their official spokesdog forever, and let them have many Kong Wubbas that they need me to do product reviews for. Please let Kong toy company see that they cannot bear to live without me being their doggie representative and that I MUST go on tours of all the King Wubba sites that make the Kong Wubba. Finally, please let them name a really cool baby blue colored Kong Wubba the "Official Kong Wubba - Pixel Edition". Remember, if you are going to dream...dream BIG!! See these sister's happy ending below! On this lovely Wordless Wednesday, I thought it would be great to see some more of the dogs and cats that Mommy and I have helped find homes for in the last month or so. Mommy volunteers each week taking pet portraits of the animals at our local shelter, then spends hours optimizing photos & making adoption posters. 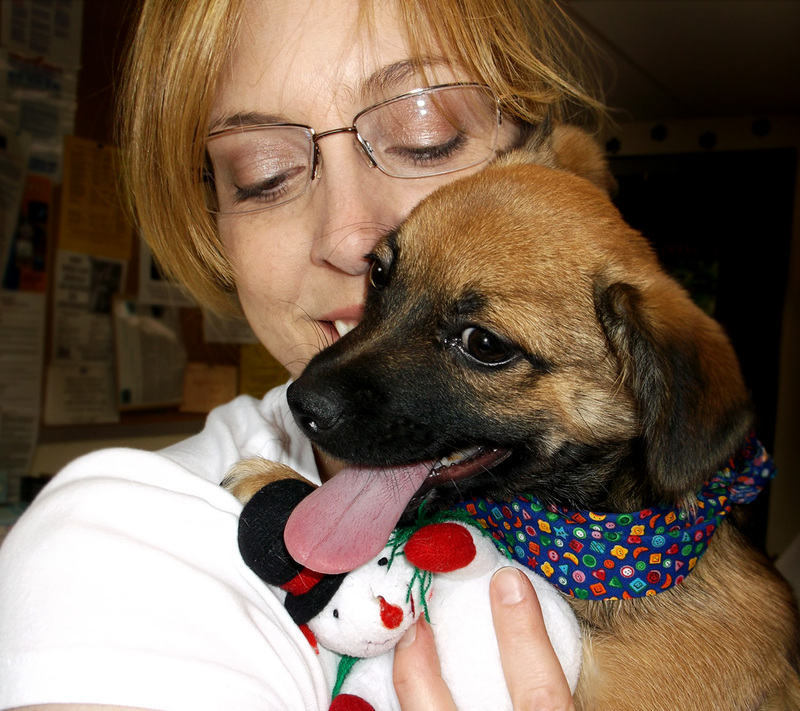 She also works directly with the shelter staff and with various rescue groups across the East Coast, finding homes for as many animals as possible. Every animal you see below, Mommy took their photos, made the posters, and worked with many wonderful people to help find them homes. She posts every poster (some are simpler than others based on time frame and urgency of getting the pets photos out there) on the Smyth County Animal Shelter Facebook page, and co-admins the page with our wonderful friend Officer Kristy Moore. 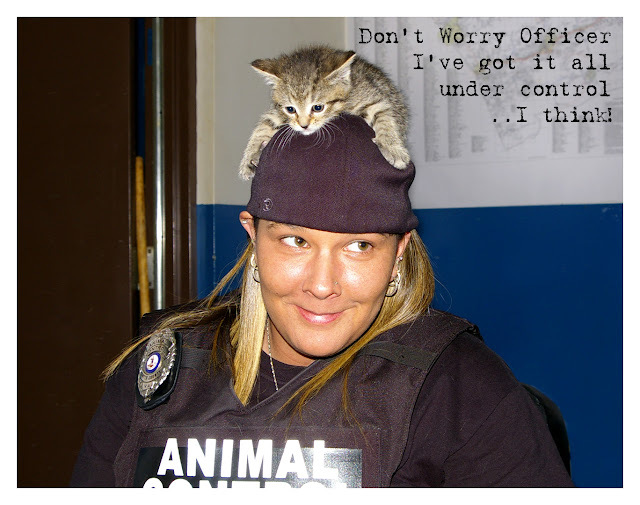 She's amazing and works tirelessly for the animals everyday, along with all the wonderful shelter staff. My part in all this is that I am very supportive of Mommy and help her get ready each week, then I sit with her for hours while she does all the additional work to get their faces out there. I share many of their posters on my "Pixel Blue Eyes" Facebook page and some of my fans have ended up adopting a friend for life after seeing them on my page. I've helped her make and model bandanas for them, I have tested out squeaky toys to make sure they will serve these pets well, and of course give love, encouragement & moral support when some happy endings don't happen. Look at all these wonderful pets, given a second chance at finding the joy in life! Mr. G was surrendered by his owners, even though he was great with kids, other pets & was house trained. He is blind in one eye & is going to a "Dogs with Disabilities" rescue. 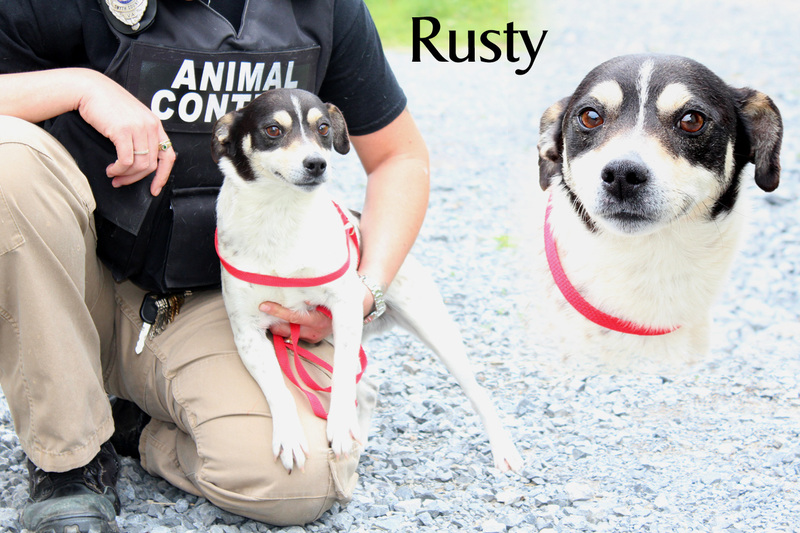 Rusty was found as a stray & is super sweet & gentle. No one came to look for him. Our friends at City Dog Rescue in DC rescued him, will get him neutered & will find him a wonderful home! Mommy got to meet this senior boy's new parents a few Saturday's ago while taking pet photos. She took this quick "Group Photo" of her & Bo as she was preparing him to leave & start his new life with a loving Mommy & Daddy! This is Officer Kristy Moore, having fun with Jack, a little 'owner surrendered' kitten whose 3 other siblings had been adopted that week. She loves the animals so much, and takes great care of them. 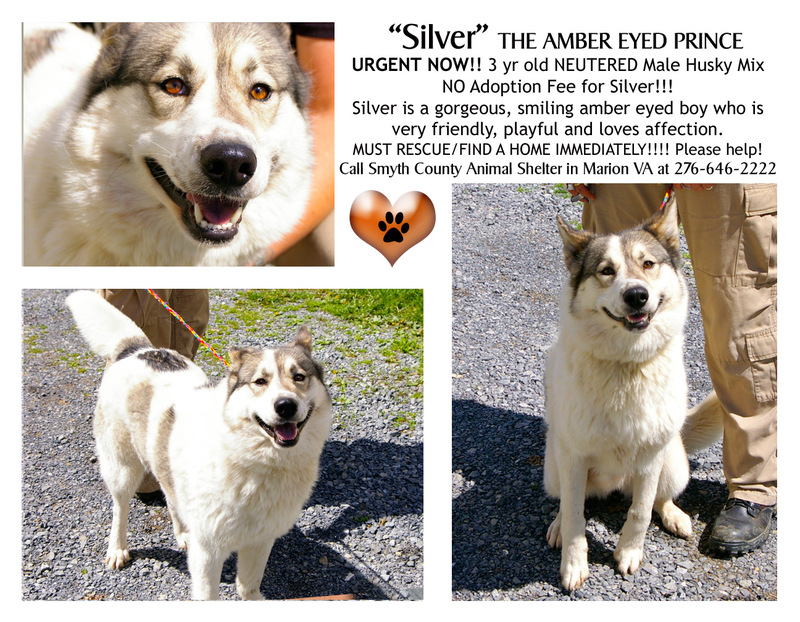 Silver was a super handsome boy who had the most amazing amber eyes Mommy had ever seen. She had him as her Facebook cover photo to try and help him get even more exposure. He was adopted & loves his new life! This special girl, Sunny, LOVED to climb the kennel walls quite literally, and she met Mommy and the shelter employees at the door on more than one occasion. 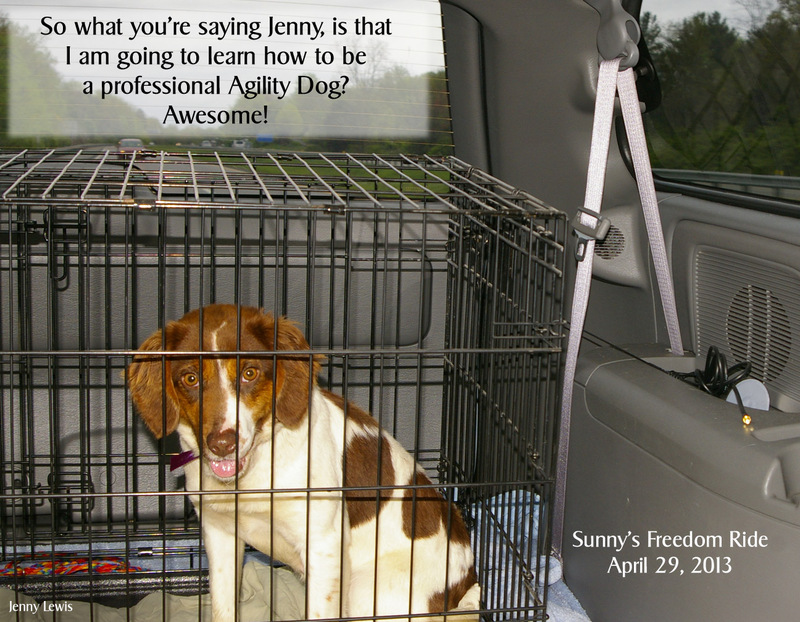 Mommy worked extra hard with some wonderful ladies to find a great foster home for Sunny where she could learn to be a professional agility dog. How exciting!! 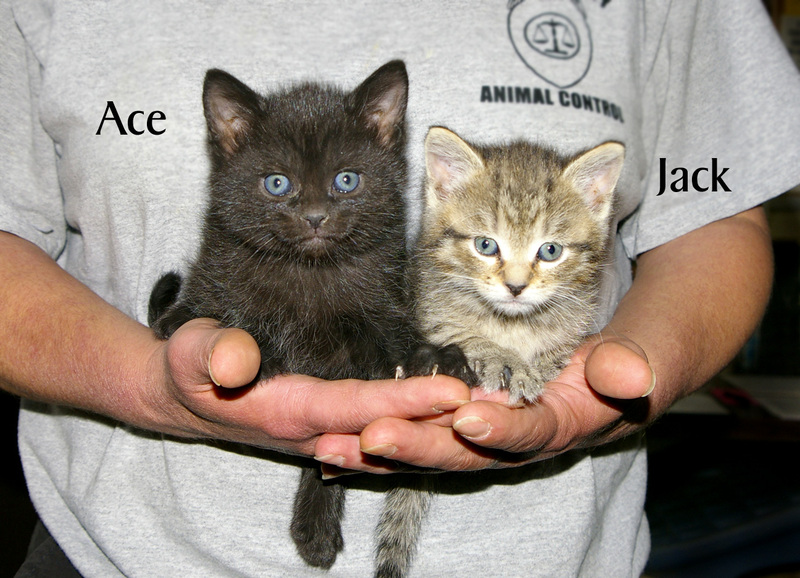 Here's Jack with his brother Ace...looking all serious but trust me, they were both a handful of funny, playful mischief! They are loving life in their new homes now. once he realized that she would not hurt him. Finally a shelter attendant was able to hold him. He loved it! 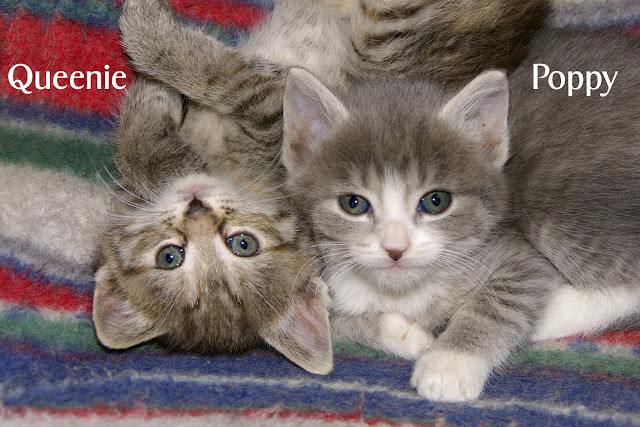 Queenie & Poppy (Ace & Jack's sisters) were total supermodels for Mommy during their photo shoot. Queenie could be quite a clown as well though, and we have some pretty funny outtakes of her antics!! Sweet Baby here was at the shelter for over a month, waiting for her forever home. Finally, a wonderful cat rescue group, Appalachian Animal Rescue took her in, got her fixed and will help her find a loving wonderful home. I know it must be so tough on them when it seems like forever and no one adopts them. Bryson was a sweet, handsome, unique looking blue Heeler Cattle dog that was surrendered by his owners for reasons unknown. He was adopted by a young woman who had two other dogs of the same breed. She later shared video of Bryson 'herding' a giant ball as tall as he was through her yard. It was wonderful to see!! 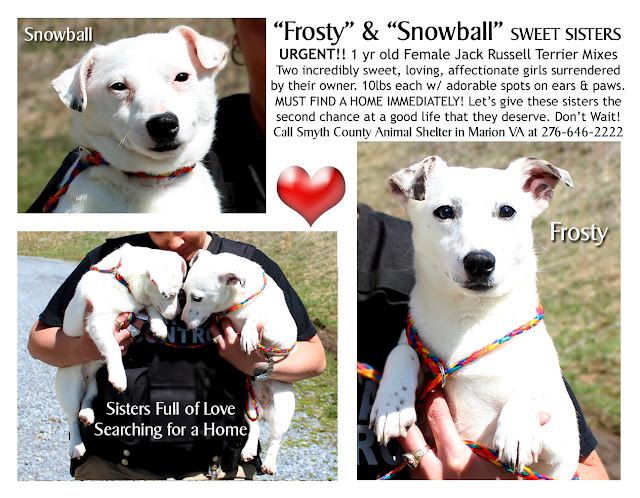 Frosty and Snowball were two beautiful sister surrendered by their owners. 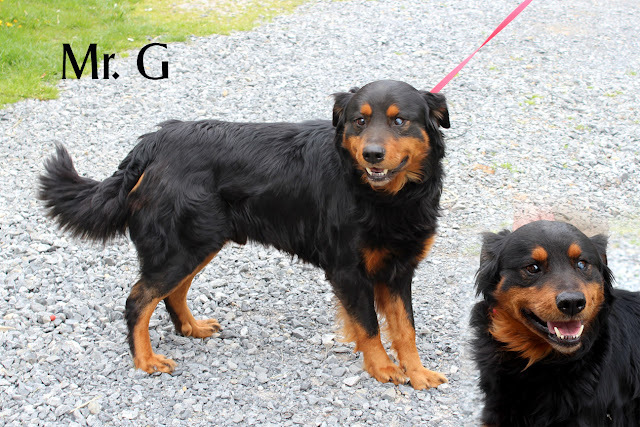 Their best chance was adopting them separate, even though they'd always been together. Mommy says they only had about 2 days to find homes for them. Snowball was adopted by a wonderful local family who just adores her and send the shelter updates. Frosty was rescued by our friends at City Dog Rescue in DC, where they will find her a fantastic new home. 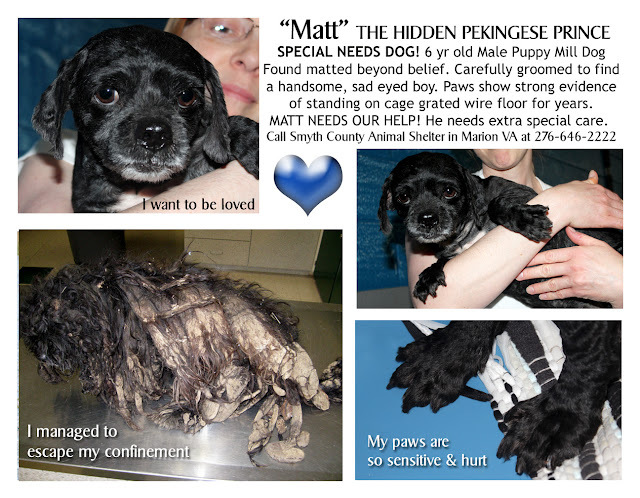 Matt was rescued by "Mutts Matter Rescue" out of Maryland, who had a Roanoke VA representative come and get him. They will be able to truly rehabilitate him and find him a loving home that understands his special needs. He will live in the 'lap of luxury' from now on! 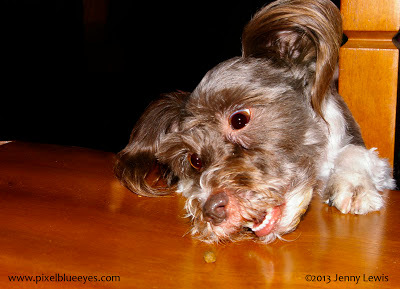 I know this is not a normal "Wordless Wednesday" post, but in a way...it fits. These animals were once wordless, they had no voice when they were first brought to the shelter, yet they had much to say. We helped them get a voice, be seen, and get a second chance at life. Isn't that what makes our life worthwhile? Making a difference for others?